I’m glad you stopped by because I have the perfect product to stay cool this summer, especially during activities. I received a bottle of Evian Brumisateur’s Facial Spray and it’s not just for staying cool. I love a multitasker but I’ll fill you in on that after I tell you what Evian’s Facial Spray is. It takes approximately 15 years for Evian’s water to filter through the French Alps, creating the perfect balance of minerals with a neutral Ph of 7.2. This is bottled at the source in France, making it pure and natural. It can be used on most sensitive skin types. The fine mist is propelled by environmentally safe nitrogen. The video below explains it all. 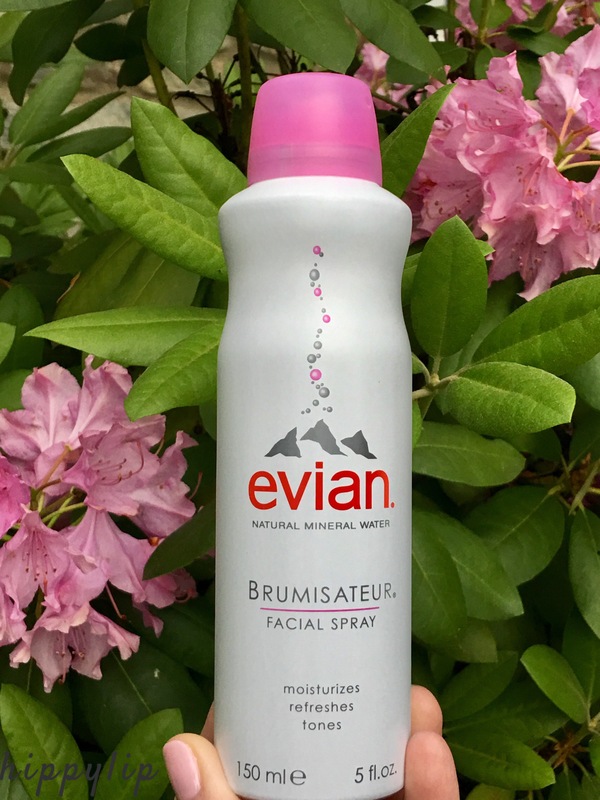 Review: Evian Brumisateur’s Facial Spray is so refreshing and dispenses a fine mist of cool & pure water. The first few times I sprayed it, the mist was spouting big droplets because I was pumping it. What you really need to do is hold that dispenser down and move over your entire face. As soon as I feel my face getting tight and dry, I spray a good bit of mist over my entire face/neck with or without makeup. There is no sticky residue or scent. There is no interference with makeup, in fact it will bring new dewy life to your face. I actually bought another so I can keep one in my bag. It works excellent at getting high pigment out of your eyeshadows. Just spritz your brush and dip in. I use my trampoline at least once a week and I love to cool down with Evian. We had a family picnic and the heat was unbearable. My family, including the children, all tried Evian and loved it. The kids thought it was cool and I thought it gave them more energy. lol. I visited a friend in NYC on a scorcher of a day and again, Evian kept us cool in Central Park. The beach is my favorite place on earth and now I pack my Facial Spray in the beach bag every time. It is a beach necessity! Evian Facial Spray worked great in the Caribbean. I wanted to stay flawless but the heat was just melting my makeup within an hour. Evian helped it last way longer with intermittent mists throughout the day. I went to Disney World with a group of 20 sick children, pushing a wheelchair for 4 days. No complaints for a good cause but Evian Spray cooled me off and gave me some pep when I needed it the most. Cooling off is what I’ve been using Evian Spray for, most of the time. As a pre-game before my nightly moisturizer. It helps my skin soak up all that moisture. As a primer for foundation. My dry skin needs something before starting my daily makeup routine. Touch-ups. If I need a touch up at an event, I mist my entire face, pat dry and touch up. Avoid the cake face. Smoothing. If I use too much foundation and actually have cake face, I use some Evian and smoothed everything over with a nice dewy finish. Increased pigmentation. I just spray Evian on my makeup brush and dip into any shade I want and it becomes super pigmented. This should be 2nd on my list because I do this a lot. Diluting my foundation. On a hot day when I really just want light coverage, I mix my foundation and Evian for a light dewy finish. To learn more about Evian Spray and check out their products head to their official site. Disclosure: I received this product for free in exchange for an honest review. All opinions are mine and 100% honest. Have you tried Evian Facial Spray? I loved this stuff for the gym. Something about this water feels more refreshing than regular water. I can’t even get through a summer on the east coast without some sort of spray. I can’t imagine AZ heat!! Enter your email address to follow hippylip and receive latest posts by email.